[www.tarot-nouveau.com] Walk with me as we examine each of the 78 tarot cards, randomly selected, in our pursuit towards self-development. Whilst I also use tarot for divination in my tarot practice, I use it as a self-developmental tool in this Tarotelic series. If you would like to hear me discuss a new card each week, tune in to Akasha Temple Live (Blogtalk Radio) for my weekly Tarotelic features, the transcripts of which will be blogged here. © Andi Graf, aka Jera Babylon Rootweaver. 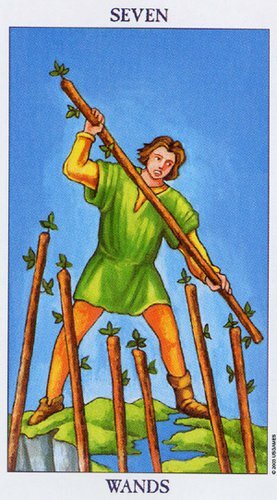 Today’s card speaks of standing our ground, even against overwhelming odds, to claim victory. When this card appears it tells us that we have made progress, and the worst is over. Rarely in military history have the odds been so unequal and the stakes so high. One of the largest armadas ever assembled appeared off the Mediterranean island of Malta. Its 200 ships had been sent by Suleiman the Magnificent, sultan of the vast Ottoman empire to destroy the Knights of Malta who had long been a thorn in his side. Aboard were crammed some 40,000 fighting men, including 6,000 of Suleiman’s elite infantry. Opposing this force were just 600 knights, a few thousand mercenaries and a few thousand Maltese irregulars – in all between 6,000 and 9,000 men. Once Malta fell the Turks would evict the Spanish from Tunis and then invade Sicily and Italy. However, in spite of the odds the Knights of Malta became the heroes of the age and the siege - one of the most celebrated events of the sixteenth century. Nearly 200 years later Voltaire could write, ‘Nothing is more well known than the siege of Malta’. These Knights of Malta gained glory and fame for standing their ground against overwhelming odds, which prevented the Turks from invading Italy. If the Knights of Malta had lost, as was expected, Malta would have been the springboard for the Turks to invade the rest of Europe. Standing our ground against overwhelming odds. More recently two ordinary people stood up against the fast-food giant McDonalds in a matter that became known as McLibel. Gardener Helen Steel and postman Dave Morris successfully humiliated McDonald’s in the biggest corporate PR disaster in history. McDonald’s loved using the UK libel laws to suppress criticism. Major media organizations like the BBC and The Guardian crumbled and apologized. But then they sued Helen Steel and Dave Morris. In the longest trial in English legal history, the “McLibel Two” represented themselves against McDonald’s £10 million legal team. Every aspect of the corporation’s business was cross-examined: from junk food and McJobs, to animal cruelty, environmental damage and advertising to children. Outside the courtroom, Dave brought up his young son alone and Helen supported herself working nights in a bar. McDonald’s tried every trick in the book against them. Legal manoeuvres. A visit from Ronald McDonald. Top executives flying to London for secret settlement negotiations. Even spies. Seven years later, in February 2005, the marathon legal battle finally concluded at the European Court of Human Rights. And the result took everyone by surprise – especially the British Government. McLibel was not just about hamburgers. It was about the importance of freedom of speech now that multinational corporations are more powerful than countries. McLibel is the David and Goliath story of two people who refused to say sorry for criticizing McDonalds and creating public awareness about the misleading advertising claiming that the food is nutritious and offers a balanced diet. They refused to apologise, proving instead that McDonalds questionable marketing was aimed at children by using a clown mascot – Ronald McDonald – to manipulate and brainwash kids. Kids who’s choice of food as well as their eating patterns and habits would determine what they would eat for the rest of their lives. And in doing so, Helen Steel and Dave Morris changed the world for the better. These two ordinary people stood their ground, they held McDonalds accountable to society on behalf of society. 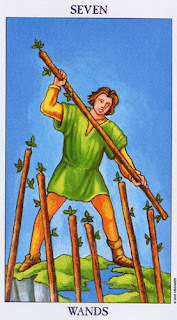 They are hero’s of our time and perfectly demonstrate the deeper meaning behind what the Seven of Wands card is trying to tell us. Just because the odds are stacked up against us it does not necessarily mean that we are fighting a losing battle. At times it is good and even necessary to stand our ground, and who knows, perhaps we too will taste victory in doing so. Illustrations from the Rider-Waite Tarot Deck®, known also as the Rider Tarot and the Waite Tarot, reproduced by permission of U.S. Games Systems, Inc., Stamford, CT 06902 USA. Copyright ©1971 by U.S. Games Systems, Inc. Further reproduction prohibited. The Rider-Waite Tarot Deck® is a registered trademark of U.S. Games Systems, Inc. This Tarotelic series is dedicated to my beloved husband, he who gives my project structure and who gives me the gift of motivation and means to live, read and write tarot.